Closeout. 140 lumens, 1.5 hours run time. 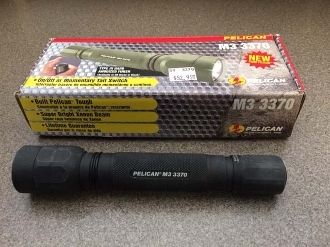 Pelican’s M3 generates 140 lumens to drive the state-of-the-art laser spot Xenon lamp module. Solid high-grade aluminum chassis with a military grade type 3 hard anodized finish protects the internal components from abuse. The no slip knurled diamond pattern on the body allows for easy activation in any environment. On/off or momentary action tail switch lets you choose how and when you need the light Cordura holster attaches to belts and securely holds the M3.This is a new flashlight but it has been sitting on the shelf for several years so the batteries have expired.